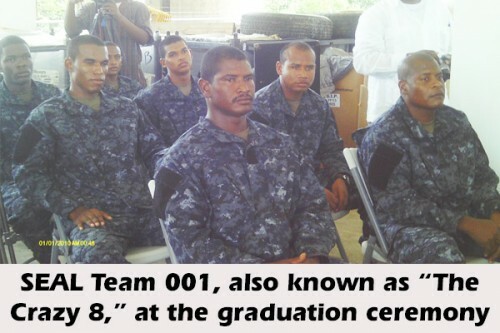 Although the Belize Coast Guard might currently be suffering from a major ‘black-eye’ due to the recent case of gross maltreatment of the Dominican Prime Minister (chronicled elsewhere in this newspaper), a brief graduation ceremony was conducted at their headquarters, located at Mile 4 on the George Price Highway, this morning to introduce a team of eight, rigorously trained Sea, Air and Land (SEAL) officers after 12 weeks of intense training. The graduating class was initially comprised of 19 hopefuls, but dwindled to 8 triumphant officers who were subjected to arduous training conditions, which tested their physical and mental endurance. During the commencement ceremony, Colonel Post, Lieutenant Commander, Special Operations, US Command South, acknowledged Coast Guard Commander John Borland as the visionary for the elite team of officers. Post said that he teamed up with Borland to help develop the capabilities of the SEAL team, and that it was three months of training and working with the prospective SEALs, along with a cohesive process that was driven by a leader’s vision, that led to the ultimate result – the graduation of eight well-prepared SEALs. CEO Lovell also humorously described the 8 graduating officers as “The Crazy 8”. This was mainly due a particular week of training, known as “Hell Week”, during which the trainees were exposed to severe physical exhaustion, and tested to the limit of human endurance, fatigue and pain. Lovell explained that the concept for this program was developed two and a half years ago, and was implemented in August of 2012, following a brutal firefight involving the Coast Guard out at sea, near Ambergris Caye. John Borland, Belize Coast Guard’s Commander described the event as “probably the most significant achievement of the Belize Coast Guard.” He said that it had always been a dream for him as a young soldier to be a part of a SEAL team, and he is glad now that it has materialized, even though he has moved up in rank. Borland said that he believes that a team like this is needed in Belize because a conventional force does not get the job done. This is the reason, he said, that this special group has emerged out of the Belize Coast Guard. He affirmed that they are the “primary fighting element of the Coast Guard”, and that they will be carrying out all special operations from now on. The Belize Coast Guard plans to draft their second intake of SEALs in January of 2014.